"They call it stormy Monday, but Tuesday's just as bad." So said blues great T-Bone Walker. For local blues fans, Monday's news was definitely bad. It's off. No Blues by the Bay this coming Labor Day weekend. St. John and the Sinners on Blues by the Bay's $10,000 stage. When we put out the Summer of Fun Summer Festival Guide last week, we reported that the local festival board would be meeting this week to decide the fate of this year's blues fest. 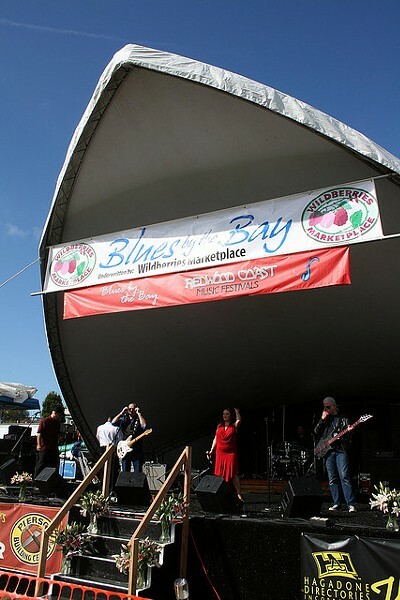 A press release from the organization sent out yesterday sealed that fate: "The Board of Directors for Redwood Coast Music Festivals Inc. announced that the organization is suspending production of the annual Blues By The Bay outdoor concert for 2013." A lot of factors went into the blues festival's decline. The demographics of the blues crowd tends toward baby boomers who don't go to festivals as much as younger people. Costs remained constant or rose. The blues fest's signature shark mouth tent alone costs $10,000 to rent. And as board member Bill Moehnke pointed out, "While the sponsorships have dried up, the headlining bands want more money. … Our mission is to help seniors and kids' music programs; we can't do that if we're losing money." Another factor was Humboldt's unpredictable weather — rain has cut into attendance more than once since the festival's date was moved from mid-summer to September. The board considered downsizing by moving the show indoors but decided against it. As the festival board president Lynn McKenna put it in yesterday's press release, the board "decided not to produce a shrunken Blues by the Bay event" since, "attendees have come to expect a spectacular, two-day festival, with nationally recognized headline blues performers." McKenna began by saying, "We hope to be back, bigger and better than ever in 2014," but unless something major changes, it seems unlikely. In the meantime plans are afoot to add some big name blues acts to the next Redwood Coast Jazz Festival in spring 2014. "We may even dedicate a whole venue to blues," said Moehnke. If the response is good, that may influence possible plans for another Blues by the Bay.